Periods of light rain will accompany warming temperatures across the Garden State on Tuesday, but big changes are looming for the days ahead. Our delightful warming trend continues on Tuesday. But this impending warmup comes at a cost for New Jersey, as bands of light rain are expected as well. This is a slight upgrade to previous forecasts, in which I called for "showers". The latest model guidance suggests steadier, more persistent "light rain" is in the forecast. So while you'll need windshield wipers and an umbrella for at least part of Tuesday, temperatures will be on the mild side. Morning temperatures are far enough above freezing that we only need to watch for isolated icy spots in the higher elevations of North Jersey. High temperatures are forecast to reach the upper 50s to around 60 degrees by Tuesday afternoon. That's about 10 degrees warmer than Monday, and about 10 degrees above normal for early March. As a cold front approaches New Jersey late Tuesday night through early Wednesday morning (after about 10 p.m.), we're prone to see one more band of heavier rain. Showers end by around 7 a.m. Wednesday, and skies will begin to clear. Overnight low temperatures will only fall to about 50 degrees, thanks to a combination of higher humidity, mostly cloudy skies, and a southerly breeze. After any lingering showers wrap up early Wednesday, skies should clear to sunshine and temperatures warm even further. With high temps topping out in the lower 60s, Wednesday should turn into a nice day. Don't get used to the warmth, though. Another cold front will kick up a brisk westerly wind for Thursday, and clouds will increase once again. While Thursday looks dry, temperatures will start to decline (eventually). I'm still putting highs in the mid to upper 50s. By Friday, thermometers will only reach the 40s at best, with a stiff northwest breeze. That's pretty cold! In addition, a quick-hitting shortwave will provide a chance for precipitation Friday morning. 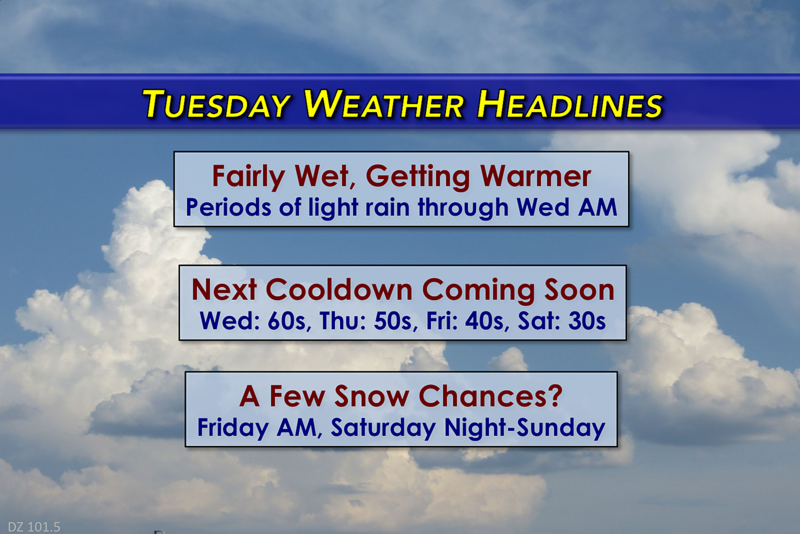 Depending on temperatures, the weather could range from all snow, to all rain, to a mix of both. The worst-case scenario for Friday puts upwards of 3 inches of snow on the ground for part of North Jersey. Just like the first weekend of March, the second weekend of the month is going to be downright frigid once again. High temperatures are expected to rise no higher than the 30s for both Saturday and Sunday. As I discussed extensively in Monday's weather blog post, we continue to watch the potential for wintry weather over the weekend. It's still just a chance — there remain many, many question marks surrounding this forecast. As of Tuesday morning's model runs, the temperature forecast for the weekend has trended colder. That causes the forecast to lean toward an "all snow" solution, even for South Jersey. Meanwhile, according to both the GFS and European models, the track of the storm has trended further south. As you'd expect, the "bullseye" of heaviest precipitation has also pushed south according to the latest data. So the storm's precipitation could brush past New Jersey, leading to dramatically lower snowfall amounts. Or, perhaps, we end up with a tight "boom or bust" snowfall gradient somewhere over the state. Or, maybe, a completely different solution plays out in the coming days. Bottom line for the weekend... Meteorologically, I am not impressed by the setup, even though the models continue to suggest impressive snow totals. With 6 days to go, it remains worth watching carefully. There are still many potential outcomes for this winter storm, ranging from "nothing/miss" to "double-digit snow totals". For now, I would keep weekend plans flexible, and continue to monitor the forecast carefully. I expect to start adding more details to this convoluted winter storm forecast late Wednesday or Thursday.